Design your interiors with emotion, desire, and a brand message. Art Of Brands, the destination in decorating your walls with passion, manages their affiliate program in ShareaSale. They offer their customer’s affordable, high quality artwork for their interior decorating needs, be it at home or at the office. Artists, designer’s, and photographers from around the world come to their website to create and sell unique artworks that have a common identity; they are all linked in some way to a “brand”. Their meaning of the word “brand” covers a broad spectrum of entities from consumer brands to sports teams to celebrities to global cities. Art Of Brands goal is to be the biggest seller of “Branded Art” on a global level and they are on their way. Each official fine art print is an original. They offer authentic museum quality artwork, custom made and individually crafted upon your needs. Art Of Brands has two main business models, Brand Art and Licensed Art. Brand Art works with global artists promoting and selling their pieces of artwork. Licensed Art is when Art Of Brands commissions artists in the creating of authentic and officially licensed fine art prints on behalf of iconic brands. Along with the unique and high quality artwork that they offer, Art Of Brands includes new artist profiles; introducing their clients to a little bit of who they are and how they get started. They also include blog posts, with their most recent one including decorating tips and ideas on how to transform your interior space at home based on what your individual passion is. They offer a wide selection of artworks at different prices, formats, and sizes. They have three different categories in which they differentiate their products. The first one is “entry priced products” that include prints on fine art paper and unframed canvas. The second is “premium products” that are comprised of framed acrylic canvas and di-bond/metal. Lastly, they offer “originals” that are unique original artworks. These are the one-off artworks which are sent directly from the artist. The majority of the art that they currently offer is car art, motorcycle art, and yacht art with much more to come in the near future. 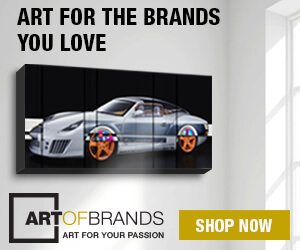 Art Of Brands is offering affiliates a 12% commission on sales. All Collector, Artist, Fashionista, and Interior Designer related affiliates are encouraged to join the Art Of Brands affiliate program in ShareaSale today! Affiliate partners can sign up directly through ShareaSale.